Why it is prescribed (Indications) : Relieving cough. It is a non-narcotic cough suppressant. It works by depressing the "cough center" in the brain. When it is to be taken : CHILDREN OVER AGE 10 AND ADULTS The usual dose is a 100-milligram perle 3 times per day, as needed. The maximum dose is 600 milligrams, or 6 perles, a day. How it should be taken : Take this medication by mouth (orally) with or without food. Swallow this medication in whole. Do not break, crush, or chew before swallowing. • It may cause drowsiness, dizziness, lightheadedness, or blurred vision. These effects may be worse if you take it with alcohol or certain medicines. Use this medication with caution. Do not drive or perform other possibly unsafe tasks until you know how you react to it. • Numbness of the mouth can occur if the medicine is chewed. Severe allergic reactions and choking can result. • It should not be used in CHILDREN younger than 10 years old; safety and effectiveness in these children have not been confirmed. • PREGNANCY and BREAST-FEEDING: If you become pregnant, contact your doctor. You will need to discuss the benefits and risks of using this medication while you are pregnant. If you are or will be breast-feeding while you use this medication, check with your doctor. Discuss any possible risks to your baby. CENTRAL NERVOUS SYSTEM-Sedation; headache; mental confusion; visual hallucinations. GI-Constipation; nausea; gastro intestinal upset. HYPERSENSITIVITY-Hypersensitivity reactions including sudden constriction of the muscles in the walls of the bronchioles, involuntary muscular contraction (spasm) of the laryngeal cords, CV collapse, possibly related to chewing the capsule. MISCELLANEOUS-Nasal congestion; eye irritation; feeling cold; chest numbness. Other Precautions : It should be swallowed whole, not chewed. Storage Conditions : Store at 25°C. Store it in air tight container and keep away from children. 1. This combination of drugs is used to relieve cramping pains in the digestive tract to treat ulcers. 2. It decreases the motion of the stomach and intestines and the secretion of acid. When it is to be taken : This medication is usually taken three or four times a day, 30 minutes before meals and at bedtime. How it should be taken : This medication comes in the form of tablets and liquid.Your prescription label tells you how much to take at each dose. 1. This medication makes some people drowsy. Do not drive a car or operate dangerous machinery until you know how it affects you. 2. Belladonna alkaloids may decrease sweating and cause heatstroke. Be careful of overheating during exercise and in hot weather. 3. Antacids may decrease the effectiveness of this medication and hence do not take antacids within one hour of taking it. Dry mouth or throat,increased eye sensitivity to light,confusion,eye pain, skin rash, constipation, blurred vision, dizziness, nervousness, rapid heartbeat, skin flushing and difficulty urinating are seen. These symptoms usually go away as your body adjusts to the medication. If they persist or severe, contact your doctor. 1. If you ever had an unusual reaction to belladonna or to any barbiturate, tell your doctor before taking this medication. 2. This medication should not be taken by patients with kidney or liver disease, glaucoma, or certain diseases of the urinary tract or heart. If you have any of these diseases, inform your doctor before you begin this drug. 3. Let your doctor know if you are pregnant or breast-feeding. 4. Tell your doctor regarding your prescription and nonprescription medications. 5. Alcoholic beverages may add to the drowsiness caused by this drug. Keep this medication in the container it came in, out of direct sunlight, and out of the reach of children. Glyburide tablets (micronized) contain smaller particle size, glyburide. Glyburide is an oral blood-glucose-lowering drug of the sulfonylurea class. Glyburide is a white, crystalline compound.Each tablet, for oral administration, contains 1.5 mg, 3 mg or 6 mg of micronized glyburide. In addition, each tablet contains the following inactive ingredients: anhydrous lactose, colloidal silicon dioxide, croscarmellose sodium, magnesium stearate, pregelatinized starch, and sodium lauryl sulfate. In addition, the 3 mg tablets contain the following ingredient: D&C Yellow #10 Aluminum Lake and the 6 mg tablets contain the following ingredients: D&C Yellow #10 Aluminum Lake and FD&C Blue #1 Aluminum Lake.The chemical name for glyburide is 1-[[p-[2-(5-Chloro-o-anisamido) ethyl]phenyl]-sulfonyl]-3-cyclohexylurea and the molecular weight is 494.01. Glyburide appears to lower the blood glucose acutely by stimulating the release of insulin from the pancreas, an effect dependent upon functioning beta cells in the pancreatic islets. The mechanism by which glyburide lowers blood glucose during long-term administration has not been clearly established. With chronic administration in Type II diabetic patients, the blood glucose lowering effect persists despite a gradual decline in the insulin secretory response to the drug. Extrapancreatic effects may be involved in the mechanism of action of oral sulfonylurea hypoglycemic drugs. The combination of glyburide and metformin may have a synergistic effect, since both agents act to improve glucose tolerance by different but complimentary mechanisms.In addition to its blood glucose lowering actions, glyburide produces a mild diuresis by enhancement of renal free water clearance. Disulfiram-like reactions have very rarely been reported in patients treated with glyburide. Single dose studies with glyburide tablets (micronized) in normal subjects demonstrate significant absorption of glyburide within one hour, peak drug levels at about two to three hours, and low but detectable levels at twenty-four hours.Bioavailability studies have demonstrated that micronized glyburide tablets 3 mg provide serum glyburide concentrations that are not bioequivalent to those from non-micronized glyburide tablets 5 mg. Therefore, the patient should be retitrated.It has been reported that in a single-dose bioavailability study in which subjects received micronized glyburide tablets 3 mg and non-micronized glyburide tablets 5 mg with breakfast, the peak of the mean serum glyburide concentration-time curve was 97.2 ng/mL for the micronized glyburide tablets 3 mg and 87.5 ng/mL for non-micronized glyburide tablets 5 mg. The mean of the individual maximum serum concentration values of glyburide (Cmax) from micronized glyburide tablets 3 mg was 106 ng/mL and that from non-micronized glyburide tablets was 104 ng/mL. The mean glyburide area under the serum concentration-time curve (AUC) for this study was 568 ng × hr/mL for micronized glyburide tablets 3 mg and 746 ng × hr/mL for non-micronized glyburide tablets 5 mg.
Glyburide tablets (micronized) are indicated as an adjunct to diet to lower the blood glucose in patients with non-insulin-dependent diabetes mellitus (Type II) whose hyperglycemia cannot be satisfactorily controlled by diet alone.Glyburide may be used concomitantly with metformin when diet and glyburide or diet and metformin alone do not result in adequate glycemic control (see metformin).In initiating treatment for non-insulin-dependent diabetes, diet should be emphasized as the primary form of treatment. Caloric restriction and weight loss are essential in the obese diabetic patient. Proper dietary management alone may be effective in controlling the blood glucose and symptoms of hyperglycemia. The importance of regular physical activity should also be stressed, and cardiovascular risk factors should be identified and corrective measures taken where possible. If this treatment program fails to reduce symptoms and/or blood glucose, the use of an oral sulfonylurea or insulin should be considered. Use of glyburide must be viewed by both the physician and patient as a treatment in addition to diet and not as a substitution or as a convenient mechanism for avoiding dietary restraint. Furthermore, loss of blood glucose control on diet alone may be transient, thus requiring only short-term administration of glyburide. Type I diabetes mellitus, as sole therapy. Gastrointestinal ReactionsCholestatic jaundice and hepatitis may occur rarely; glyburide should be discontinued if this occurs.Liver function abnormalities, including isolated transaminase elevations, have been reported.Gastrointestinal disturbances, e.g., nausea, epigastric fullness, and heartburn are the most common reactions, having occurred in 1.8% of treated patients during clinical trials. They tend to be dose related and may disappear when dosage is reduced. Dermatologic ReactionsAllergic skin reactions, e.g., pruritus, erythema, urticaria, and morbilliform or maculopapular eruptions occurred in 1.5% of treated patients during clinical trials. These may be transient and may disappear despite continued use of glyburide. If skin reactions persist, the drug should be discontinued.Porphyria cutanea tarda and photosensitivity reactions have been reported with sulfonylureas. Hematologic ReactionsLeukopenia, agranulocytosis, thrombocytopenia, hemolytic anemia, aplastic anemia, and pancytopenia have been reported with sulfonylureas. Metabolic ReactionsHepatic porphyria and disulfiram-like reactions have been reported with sulfonylureas; however, hepatic porphyria has not been reported with glyburide and disulfiram-like reactions have been reported very rarely.Cases of hyponatremia have been reported with glyburide and all other sulfonylureas, most often in patients who are on other medications or have medical conditions known to cause hyponatremia or increase release of antidiuretic hormone. The syndrome of inappropriate antidiuretic hormone (SIADH) secretion has been reported with certain other sulfonylureas, and it has been suggested that these sulfonylureas may augment the peripheral (antidiuretic) action of ADH and/or increase release of ADH. Other ReactionsChanges in accommodation and/or blurred vision have been reported with glyburide and other sulfonylureas. These are thought to be related to fluctuation in glucose levels.In addition to dermatologic reactions, allergic reactions such as angioedema, arthralgia, myalgia and vasculitis have been reported. Patients should be retitrated when transferred from non-micronized glyburide tablets or other oral hypoglycemic agents.There is no fixed dosage regimen for the management of diabetes mellitus with glyburide tablets (micronized) or any other hypoglycemic agent. In addition to the usual monitoring of urinary glucose, the patient's blood glucose must also be monitored periodically to determine the minimum effective dose for the patient; to detect primary failure, i.e., inadequate lowering of blood glucose at the maximum recommended dose of medication; and to detect secondary failure, i.e., loss of adequate blood glucose lowering response after an initial period of effectiveness. Glycosylated hemoglobin levels may also be of value in monitoring the patient's response to therapy.Short-term administration of glyburide may be sufficient during periods of transient loss of control in patients usually controlled well on diet. 1. Beclomethasone is a corticosteroid which is similar to a natural substance produced by your adrenal glands. 2. It is used to treat asthma. 3. Beclomethasone is also used to shrink nasal polyps (lumps) and prevent them from returning after surgical removal and to relieve runny or stuffy nose, sneezing and itching of the nose and upper throat. 4. It may also decrease itching, redness and watering of the eyes and eyelid puffiness, especially if these symptoms are caused by allergies. 5. Beclomethasone nasal inhalation does not provide immediate relief from runny or stuffy nose, sneezing and itching. 6. Your doctor may recommend decongestant nosedrops or spray or an oral antihistamine to help control your symptoms. 1. Beclomethasone usually is used two to four times a day. Follow the instructions on your prescription label carefully. 2. Take beclomethasone at evenly spaced intervals between the time you wake up in the morning and the time you go to bed at night. For example, if your doctor tells you to take it three times a day, take it at 7 a.m., 3 p.m., and bedtime. 3. Although your asthma may improve when you start to use beclomethasone and nasal symptoms usually are relieved within several days, you may need to use beclomethasone regularly for several weeks before you get its full effects. 1. Beclomethasone comes in the form of aerosol for oral inhalation or aerosol for nasal inhalation. 2. Your prescription label tells you how many inhalations to take at each dose. 1. Once a day, remove the metal canister from the oral or nasal inhaler and rinse the mouthpiece or nosepiece and ca with warm water; dry them thoroughly. 2. Keep all appointments with your doctor and the laboratory, especially if you take beclomethasone for a long time, Checkups are particularly important for children. 3. Beclomethasone must be used regularly to be effective. However, do not use more of it and do not use it more often than your doctor has directed. 4. If your symptoms do not improve or if your condition worsens, contact your doctor. 1. Voice problems are frequent . Rest your voice. Dry or irritated throat or mouth, tongue irritation, abnormal sense of taste are commonly seen with oral inhalation. Rinse your mouth with water after each treatment. 2. Increased wheezling, difficulty breathing, creamy white, curdlike patches on your tongue and in your mouth, mouth or lip sores are seen rarely. 3. Nasal burning, irritation or bleeding are common with nasal inhalation. If these problems persist, contact your doctor. 4. Sneezing attack is rare. After the attack stops, blow your nose to clear it and repeat the dose. If attacks persist, contact your doctor.You may need to switch to another drug. 1. Before you take beclomethasone, tell your doctor regarding your prescription and nonprescription medications, especially oral corticosteroids, aspirin, arthritis medication, and estrogen. 2. Before you take beclomethasone, tell your doctor if you are pregnant or breast-feeding. 3. Before you take this drug, tell your doctor your entire medical history. 4. If you are switching or have recently switched from an oral corticosteroid to beclomethasone inhalation and have an injury , infection or severe asthma attack, take a full dose of the corticosteroid and contact your doctor for further instructions. 1. Keep this medication out of the reach of children. 2. Store it at room temperature,away from excessive heath and cold. 3. Do not puncture your inhaler or store it near an open flame. Pharmacognosy & Phytochemistry – Chemistry, tests, isolation, characterization and estimation of phytopharmaceuticals belonging to the group of Alkaloids, Glycosides, Terpenoids, Steroids, Bioflavanoids, Purines, Guggul lipids. Pharmacognosy of crude drugs that contain the above constituents. Standardization of raw materials and herbal products. WHO guidelines. Quantitative microscopy including modern techniques used for evaluation. Biotechnological principles and techniques for plant development, Tissue culture. General pharmacological principles including Toxicology. Drug interaction. Pharmacology of drugs acting on Central nervous system, Cardiovascular system, Autonomic nervous system, Gastro intestinal system and Respiratory system. Pharmacology of Autocoids, Hormones, Hormone antagonists, chemotherapeutic agents including anticancer drugs. Bioassays, Immuno Pharmacology. Drugs acting on the blood & blood forming organs. Drugs acting on the renal system. Structure, nomenclature, classification, synthesis, SAR and metabolism of the following category of drugs, which are official in Indian Pharmacopoeia and British Pharmacopoeia. Introduction to drug design. Stereochemistry of drug molecules. Hypnotics and Sedatives, Analgesics, NSAIDS, Neuroleptics, Antidepressants, Anxiolytics, Anticonvulsants, Antihistaminics, Local Anaesthetics, Cardio Vascular drugs – Antianginal agents Vasodilators, Adrenergic & Cholinergic drugs, Cardiotonic agents, Diuretics, Anti-hypertensive drugs, Hypoglycemic agents, Antilipedmic agents, Coagulants, Anticoagulants, Antiplatelet agents. Chemotherapeutic agents – Antibiotics, Antibacterials, Sulphadrugs. Antiprotozoal drugs, Antiviral, Antitubercular, Antimalarial, Anticancer, Antiamoebic drugs. Diagnostic agents. Preparation and storage and uses of official Radiopharmaceuticals, Vitamins and Hormones. Eicosanoids and their application. Development, manufacturing standards Q.C. limits, labeling, as per the pharmacopoeial requirements. Storage of different dosage forms and new drug delivery systems. Biopharmaceutics and Pharmacokinetics and their importance in formulation. Formulation and preparation of cosmetics – lipstick, shampoo, creams, nail preparations and dentifrices. Pharmaceutical calculations. Drugs and cosmetics Act and rules with respect to manufacture, sales and storage. Pharmacy Act. Pharmaceutical ethics. Principles, instrumentation and applications of the following: Absorption spectroscopy (UV, visible & IR). Fluorimetry, Flame photometry, Potentiometry. Conductometry and Polarography. Pharmacopoeial assays. Principles of NMR, ESR, Mass spectroscopy. X-ray diffraction analysis and different chromatographic methods. Biochemical role of hormones, Vitamins, Enzymes, Nucleic acids, Bioenergetics. General principles of immunology. Immunological. Metabolism of carbohydrate, lipids, proteins. Methods to determine, kidney & liver function. Lipid profiles. :Principles and methods of microbiological assays of the Pharmacopoeia. Methods of preparation of official sera and vaccines. Serological and diagnostics tests. Applications of microorganisms in Bio Conversions and in Pharmaceutical industry. Therapeutic Drug Monitoring Dosage regimen in Pregnancy and Lactation, Paediatrics and Geriatrics. Renal and hepatic impairment. Drug – Drug interactions and Drug – food interactions, Adverse Drug reactions. Medication History, interview and Patient counselling. 1. Baclofen acts on the spinal cord nerves and decreases the number and severity of muscle spasms caused by multiple sclerosis or spinal cord diseases. 2. It also relieves pain and imporves muscle movement. 3. Baclofen also may relieve muscle rigidity caused by diseases such as cerebral palsy, stroke, and brain lesions. When it is to be taken : Baclofen is usually taken three times a day at evently spaced intervals. For example, if you are to take it three times a day, take it every eight hours. It may take up to two months before you feel the full effects of baclofen. Follow the instructions on your prescription label carefully. 1. Baclofen makes some people drowsy. Do not drive a car or operate dangerous machinery until you know how it affects you. 2. Keep all appoints with your doctor; it may be necessary to adjust your dose. 3. If you forget to take a dose,take the missed dose as soon as you remember it. Take any remaining doses for that day at evenly spaced intervals. Do not take a double dose to make up for a missed one. Drowsiness,dizziness, weakness, confusion, headache, fatigue, nausea, frequent urination. Contact your doctor but do not stop taking the medication until your doctor tells you to do so. 1. Alcoholic beverages may add to the drowsiness caused by baclofen. Ask your doctor or pharmacist how much alcohol is safe to drink. 2. If you ever had a bad reaction to baclofen, tell your doctor before taking it again. 3. If you have epilepsy, kidney disease or ulcers, tell your doctor before you take baclofen. 4. If you are taking sleeping pills, muscle relaxants or tranquilizers, tell your doctor. These drugs may add to the drowsiness caused by baclofen. Storage Conditions : Keep this medication in the container it came in and out of the reach of children. Store it at room temperature. Why it is prescribed (Indications) : ACETAMINOPHEN-BUTALBITAL-CAFFEINE is a combination product used to treat certain types of headaches and migraines as well as mild to moderate pain. It is used to treat tension headaches. Butalbital belongs to the group of medicines called barbiturates. Caffeine may help to relieve headaches. Butalbital, acetaminophen and caffeine combination may also be used for other kinds of headaches or other kinds of pain as determined by your doctor. When it is to be taken : This medication is usually taken every four hours. Follow the instructions on your prescription label carefully.Your prescription would tell the exact amount to be taken at each dose. 1. This drug may cause drowsiness. Do not drive a car or operate any dangerous machinery. Alcoholic beverages can cause additional drowsiness. 2. This medication may be habit-forming. Do not take it more often or for a longer period of time.Do not take more amount of drug than presribed at each dose. Nausea, vomiting and Stomach pain are seen. Take this medication after meals. If these effects continue, contact your doctor. 1. Inform your doctor regarding your drug history. 2. Do not take antihistamines, sleeping pills, tranquilizers, antidepressants, sedatives or any other medication. 3. Inform your doctor, if you have a history of liver disease or depression. 4. If you are a pregnant or a breast-feeding women, inform your doctor before taking this medication. 5. Do not allow anyone else to take this medication. Keep this medication in a tightly closed container.Keep it out of reach of children. Store it in a cool and dry place. Why it is prescribed (Indications) : Acetaminophen is a non-opiate, non-salicylate analgesic and antipyretic. Acetaminophen is a less potent pain reliever that increases the effects of propoxyphene. Propoxyphene (related to codeine) is in a class of drugs called narcotic analgesics. It works by changing the way your body feels pain. Together, acetaminophen and propoxyphene are used to relieve pain. Acetaminophen and propoxyphene may also be used for other purposes. When it is to be taken : This medication is usually taken every four hours. Follow the instructions on your prescription label carefully. 1.This medication may cause drowsiness. Do not drive a car or operate dangerous machinery. 2.Propoxyphene can be habit-forming. Do not take this medication more often or for a longer duration of time. 3.Do not take more than the presribed amount at each dose. 4.Do not smoke while taking this medication. Smoking can decrease its effectiveness. Side effects from acetaminophen with propoxyphene are not common. The side effects that are seen rarely are drowsiness, dizziness, nausea, vomiting and stomach pain. 1. Do not increase your dosage without consulting your doctor. 2. Symptoms of propoxyphene overdose include weakness, difficulty in breathing and confusion. Some patients may become unconscious. 3. Do not take sedatives, tranquilizers, muscle relaxants, antidepressants, sleeping pills or any other pain relievers. 4. An overdose of acetaminophen can be harmful. Alcoholic beverages can cause additional drowsiness. Storage Conditions : Keep this medication in the container it came in and keep it out of reach of children. Why it is prescribed (Indications) : Acetaminophen is a non-opiate, non-salicylate analgesic and antipyretic. Oxycodone (related to codeine) is in a class of drugs called narcotic analgesics. It relieves pain. Acetaminophen is a less potent pain reliever that increases the effects of oxycodone. Together, acetaminophen and oxycodone are used to relieve moderate-to-severe pain. When it is to be taken : This medication is usually taken every six hours. Follow the instructions on your prescription label carefully. 1.This medication can be habit-forming. Do not take it more often or for a longer duration of time.Do not take more amount of drug than prescribed at each dose. 2. This drug combination may decrease mental alertness. Do not drive a car or operate any dangerous machinery. Side Effects : The side effects from acetaminophen with oxycodone are not common. Nausea, vomiting, drowsiness, dizziness and difficulty in breathing are rarely seen. 1. If you are allergic to codeine or acetaminophen,inform your doctor before you take this medication. 2.Do not take analgesics, sleeping pills, tranquilizers, antidepressants, sedatives, or any other medication while taking this drug. Keep this medication in the container it came in.Keep it out of the reach of children. Why it is prescribed (Indications) : Hydrocodone bitartrate is an opioid analgesic and antitussive. Acetaminophen is a non-opiate analgesic (pain killer) and antipyretic (reduces fever). Acetaminophen is a less potent pain reliever that increases the effects of hydrocodone bitartrate. This combintaion of drugs is used to relieve mild to moderate pain. When it is to be taken : This medication is usually taken every four to six hours as needed. Follow the instructions on your prescription carefully. 1.This drug can be habit-forming. Do not take it more often or for a longer duration of time.Do not take more than the amount prescribed at each dose. 2.This drug make some people drowsy. Do not drive a car or operate any dangerous machinery . Alcohol may increase the drowsiness caused by this drug. Do not drink alcoholic beverages while taking this medication. Although side effects from acetaminophen with hydrocodone bitartrate are not common, they can occur.The common side effects are lightheadedness, dizziness, drowsiness, nausea, vomiting, lethargy, impaired mental and physical performance, mood changes, constipation. 1. Do not take sleeping pills, tranquilizers, sedatives, antidepressants or other pain relievers without consulting your doctor. 2. An overdose of acetaminophen can be harmful. 3. Before you take this drug, be sure that your doctor knows your entire medical history, especially if you have a liver or kidney disease. 4. Pregnant or a breast-feeding women should inform their doctor before taking this medication. 5. Tell your doctor if you ever had a reaction to acetaminophen, hydrocodone or sulfites. 6. Do not allow anyone else to take this medication. Storage Conditions : Keep this medication out of reach of children. TradeName : TYLENOL, CROCIN, METACIN, ANACIN, DATRIL, LIQUIPRIN, PANADOL, VALADOL. Why it is prescribed (Indications) : Acetaminophen is a nonopiate, non-salicylate analgesic and antipyretic. Codeine is an alkaloid, obtained from opium or prepared from morphine. This combination of drugs is used to relieve mild to moderate pain; acetaminophen also reduces fever and codeine reduces coughing. When it is to be taken : This medication is usually taken every four hours.Follow the instructions on your prescription carefully. 1. This drug can be habit-forming. Do not take it more often or for a longer period of time. 2. Codeine makes some people drowsy. Do not drive a car or operate any dangerous machinery. The side effects seen rarely are dizziness, drowsiness, nausea, vomiting, difficulty in breathing, fainting,stomach pain, constipation. Other Precautions : 1. Alcohol may increase the drowsiness caused by this drug. Do not drink alcohol beverages while taking this medication. 2. Do not take sleeping pills, tranquilizers, sedatives, antidepressants, or other pain relievers without consulting your doctor. 3. Before you take this drug, see to it that your doctor knows your entire medical history. 5. Do not take this medication if you have had a previous allergic reaction to codeine or acetaminophen. Storage Conditions : Keep this medication out of the reach of children. Why it is prescribed (Indications) : Acetaminophen is a non-opiate, non-salicylate analgesic and antipyretic. Acetaminophen is used to relieve pain and reduce fever. Unlike aspirin, it does not relieve the redness, stiffness, or swelling caused by rheumatoid arthritis. However, it may relieve the pain caused by mild forms of arthritis. 1. Follow the prescription carefully.Take only the prescribed amount of drug.Overdose can be harmful. 2.Adults are not suppossed to take acetaminophen for more than 10 days. 3.Acetaminophen should not be taken by adults or children for high fever or fever lasting for more than three days without a doctor's supervision. 4. Do not give a child more than five doses in 24 hours unless directed to do so by a physician. When taken for a short period of time as directed,acetaminophen is virtually free of side effects. 1. Before taking any other drugs,see to it that they do not contain acetaminophen. Keep this medication out of the reach of children. Store it at room temperature. When it is not to be taken (Contraindications) : Before taking aceclofenac consult your doctor * If you are pregnant, trying for a baby or breast-feeding. * If you suffer from any stomach problems,liver or renal problems,asthma, heart problems and clotting disorders. When it is to be taken : It is given as 100 mgs given twice by mouth and should be swallowed with a sufficient quantity of liquid. How it should be taken : It comes as 100 and 200mgs tablets. * Like other NSAIDs, allergic reactions, including anaphylactic/ anaphylactoid reactions, can occur without earlier exposure to the drug. * Caution should also be exercised in patients with history of coagulation defects and history of liver problems. * Kidney,liver function and blood counts should be monitored during long term treatment. Persistent elevated levels of hepatic enzyme is an indication for withdrawal of aceclofenac . * Chronic heavy alcohol abusers may be at risk of liver toxicity from excessive aceclofenac use. Renal impairment Patients with mild renal function should be monitored regularly since the use of NSAIDs may result in deterioration of renal function. Renal function usually reversible on withdrawal of aceclofenac. The most frequent side effects are gastro-intestinal disorders, in particular dyspepsia, abdominal pain, nausea, vomitting, diarrhea, and occasional occurrence of dizziness. Dermatological complaints includes pruritus, rash, abnormal hepatic enzyme and serum creatinine levels have also been reported. In case of serious adverse reactions, Aceclofenac should be withdrawn. Contraindicated in pregnancy,breast feeding and elderly Patients with a history of coagulation,liver dysfunction should use this drug with care. * Aceclofenac should be used with caution in elderly patients with renal, hepatic or cardiovascular impairment. Aceclofenac can increase plasma concentrations of lithium, digoxin and methotrexate, increase the activity of anticoagulants, inhibit the activity of diuretics, enhance cyclosporin nephrotoxicity and precipitate convulsions when co-administered with quinolone antibiotics. When administeres concomitantly with potassium sparing diuretics (spirinolactone)is employed, serum potassium should be monitored. Hypo or hyperglycaemia can result from the concomitant administration of aceclofenac and antidiabetic drugs. The co-administration of aceclofenac with other NSAIDs or corticosteroids may increase the frequency of side effects. Store it in air tight container in a cool dry place. Protect from light. TradeName : Lyzop, Ziclone, Zolinox, Zolium, Zonap, Zopicon, Zopitran. Why it is prescribed (Indications) : Zopiclone is used on a short-term basis to treat insomnia-to help you fall asleep and stay asleep through the night. When it is to be taken : Zopiclone is taken at bedtime when needed. Follow the instructions on your prescription label carefully. Do not take Zopiclone for more than 1-2 weeks without consulting your doctor. How it should be taken : Zopiclone comes in the form of tablets. Your prescription label tells you how much to take at each dose. Swallow the tablets whole; do not split, chew, or crush them. 1. Zopiclone may make you dizzy. Therefore stay in bed after taking the drug. The dizziness may persist until the next day, and your coordination and alertness may be decreased. Do not drive a car or operate dangerous machinery until you know how this drug affects you. 2. Since Zopiclone can be habit-forming, do not take more of it or take it for a longer period than prescribed. 3. To prevent an accidental overdose, do not keep more than one dose at your bedside. If you accidentally take too much Zopiclone, contact your doctor immediately or go to the nearest hospital emergency department. 1. Zopiclone may cause side effects like drowsiness, headache, dizziness, 'drugged feeling’, and loss of coordination. 2. It can also cause gastrointestinal symptoms like vomiting, and a metallic or bitter taste in the mouth. Consult your doctor if any of these symptoms are severe or do not go away. 1. Tell your doctor if you have or have ever had myasthenia gravis, sleep apnea (condition in which the patient briefly stops breathing many times during the night), other breathing problems, or liver or kidney disease. 2. Do not take other sleeping pills while taking Zopiclone. Do not drink alcoholic beverages. Alcohol adds to the drowsiness and dizziness caused by this drug. 3. Before you take this drug, tell your doctor what prescription and nonprescription drugs you are taking, especially antidepressants such as imipramine , itraconazole, seizure medication like phenytoin and carbamazepine, prescription pain medication, barbiturates, tranquilizers, sedatives, antihistamines, and medication for allergies and colds. , plan to become pregnant, think they may be pregnant, or are breast-feeding should tell their doctors. If you become pregnant, contact your doctor immediately. 2. Store it at room temperature. Why it is prescribed (Indications) : Zolpidem is used on a short-term basis to treat insomnia - to help you fall asleep and stay asleep through the night. Zolpidem belongs to a class of medications called sedative-hypnotics. It works by slowing activity in the brain. When it is to be taken : Zolpidem is taken at bedtime when needed. Follow the instructions on your prescription label carefully. Do not take Zolpidem for more than 1-2 weeks without consulting your doctor. How it should be taken : Zolpidem comes in the form of tablets. Your prescription label tells you how much to take at each dose. 1. Zolpidem may make you dizzy. Therefore stay in bed after taking the drug. The dizziness may persist until the next day, and your coordination and alertness may be decreased. Do not drive a car or operate dangerous machinery until you know how this drug affects you. 2. Since Zolpidem can be habit-forming, do not take more of it or take it for a longer period than prescribed. 3. To prevent an accidental overdose, do not keep more than one dose at your bedside. If you accidentally take too much Zolpidem, contact your doctor immediately or go to the nearest hospital emergency department. 4. If you have been taking Zolpidem for a long time, you may have withdrawal symptoms when you stop. Contact your doctor if you experience sweating, vomiting, diarrhoea, tremors, muscle and abdominal cramps, hallucinations, or seizures. Keep all appointments with your doctor. 1. Zolpidem may cause side effects like drowsiness, headache, dizziness, 'drugged feeling’, and loss of coordination. 2. It can also cause gastrointestinal symptoms like vomiting, constipation, diarrhea, gas, heartburn, and stomach pain or tenderness. Consult your doctor if any of these symptoms are severe or do not go away. 1. Tell your doctor if you have or have ever had depression, sleep apnea (condition in which the patient briefly stops breathing many times during the night), other breathing problems, or liver or kidney disease. 2. Do not take other sleeping pills while taking Zolpidem. Do not drink alcoholic beverages. Alcohol adds to the drowsiness and dizziness caused by this drug. 3. Before you take this drug, tell your doctor what prescription and nonprescription drugs you are taking, especially antidepressants such as imipramine , itraconazole, Rifampicin, seizure medication, prescription pain medication, barbiturates, tranquilizers, sedatives, antihistamines, and medication for allergies and colds. 4. Women who are pregnant, plan to become pregnant, think they may be pregnant, or are breast-feeding should tell their doctors. If you become pregnant, contact your doctor immediately. 5. Do not allow anyone else to take this medication. 1. Keep this medication in the container it came in and out of the reach of children. 2. Store it at room temperature. TradeName : Ascazinc, becozinc, beplax-zee, bethaclozin-p, cobadex-z, lysion-v, optisulin, polyzee, stress-zn, ulseel, vitazinc, zenbex-T, zevit, zi complex. Why it is prescribed (Indications) : It is an essential trace element. It plays an important role in physiological process especially in enzymatic reactions involving carbohydrates,protein and lipid metabolism, wound healing and immunity. When it is to be taken : Take this medication as 1-2 tablets daily,5-15 mgs/kg/day in 3 doses in children. Special Instruction : Do not exceed the prescribed dose. Side Effects : Nausea ,vomiting and abdominal pain. Other Precautions : The drug interacts with tetracyclines,Flouroquinolones,pencillamine and iron. Storage Conditions : Store at room temperature in a tight container. keep it away from sunlight and moisture. Why it is prescribed (Indications) : It is an essential trace element. It palys an important role in physiological process especially in enzymatic reactions involving carbohydrates,protein and lipid metabolism, wound healing and immunity. Side Effects : Nausea, vomiting and abdominal pain. Why it is prescribed (Indications) : Zidovudine is used to treat symptoms of human immunodeficiency virus (HIV) infections in acquired immunodeficiency syndrome (AIDS) or advanced AIDS-related complex (ARC). Treatment with zidovundine dose not prevent the spread of AIDS to other people. This drug cannot cure HIV infections, but it may decrease the frequency and severity of complications associated with AIDS and ARC. Zidovudine may slow or stop the progression of HIV infections. When it is to be taken : Zidovudine is usually taken every four hours around the clock. Follow the instructions on your prescription label carefully. It is important to interrupt your normal sleep and activity schedule to take doses of zidovudine. How it should be taken : Zidovudine comes in the form of capsules and syrup. Your prescription label tells you how much to take at each dose. 1. Keep all appointments with your doctor and the laboratory. Your doctor will want to evaluate your response to this medication with regular physical exams and blood tests. Your dose may need to be adjusted or stopped if this drug causes side effects. 2. Do not stop taking this medication without consulting your doctor. 3. If you forget to take a dose, take the missed dose as soon as you remember it and continue your regular dosing schedule. However, if you remember the missed dose near the time you are to take the next dose, space the missd dose and the regularly scheduled dose two to three hours apart. Then resume your regular dosing schedule. Do not take a double dose to make up for a missed dose. or constipation, indestion, gas loss of appetite. Take zidovudine with food or milk. 2. Headache, weakness, sleepiness or difficulty sleeping, dizziness or fainting, nervousnes, restlessness, confusion, depression, difficulty swallowing, changes in taste, swelling of the tongue, bleeding gums or mouth sores, muscle aches, back pain, sweating, rash. Contact your doctor if these effects persist or are severe. 3. Unusual bleeding or bruisingt; unusual tiredness or weakness; pale skin; fever, chills, and sore throat. Contact your doctor immediately. You may need a blood transfusion. 1. Tell your doctor what prescription and nonprescription drugs you are taking, especially acetaminophen, aspirin, medications containing acetaminophen or aspirin, indomethacin, cimetidine, lorazepam, acyclovir, amphotericin B, dapsone, flucytosine, pentamidine, phenytoin, and chemo therapy drugs. 2. Before you take zidovudine, tell your doctor if you have a hstory of anemia, bleeding, or other blood problems or liver or kidney disease. 3. Women who are pregnant or breast-feeding should inform their doctors. 4. Do not allow anyone else to take your medication. 1. Keep this medicaiton in the container it came in, tightly closed, and out the reach of children. 2. Store zidovudine at room temperature and away from light. Why it is prescribed (Indications) : Zaleplon is used on a short-term basis to treat insomnia. It helps you to fall asleep and stay asleep through the night. When it is to be taken : Zaleplon is taken at bedtime when needed. Follow the instructions on your prescription label carefully. Zaleplon can be habit-forming; do not take a larger dose, take it more often, or take it for a longer period than your doctor tells you to. Do not stop taking zaleplon without talking to your doctor. How it should be taken : Zaleplon comes as a capsule and is taken orally. Do not take zaleplon with or right after a high-fat or heavy meal. 1. Zaleplon may make you dizzy. Therefore stay in bed after taking the drug. The dizziness may persist until the next day, and your coordination and alertness may be decreased. Do not drive a car or operate dangerous machinery until you know how this drug affects you. 2. Since Zaleplon can be habit-forming, do not take more of it or take it for a longer period than prescribed. 3. To prevent an accidental overdose, do not keep more than one dose at your bedside. If you accidentally take too much Zaleplon, contact your doctor immediately or go to the nearest hospital emergency department. 1.Zopiclone may cause side effects like drowsiness, headache, dizziness, loss of coordination, lightheadedness, constipation,dry mouth and muscle aches. 2.It can also cause,chest pain, difficulty breathing, fever, behavior changes, mental confusion, abnormal thinking or dreams, hallucinations, depression, worsening of insomnia and problems with memory. Consult your doctor if any of these symptoms are severe or do not go away. 1.Tell your doctor if you have or have ever had myasthenia gravis, sleep apnea (condition in which the patient briefly stops breathing many times during the night), other breathing problems, or liver or kidney disease. 2.Do not take other sleeping pills while taking Zaleplon. Do not drink alcoholic beverages. Alcohol adds to the drowsiness and dizziness caused by this drug. 3.Women who are pregnant, plan to become pregnant, think they may be pregnant, or are breast-feeding should tell their doctors. If you become pregnant, contact your doctor immediately. 4.Before you take this drug, tell your doctor what prescription and nonprescription drugs you are taking, especially antidepressants such as imipramine, itraconazole, seizure medication like phenytoin and carbamazepine, prescription pain medication, cimetidine, rifampin, barbiturates, tranquilizers, sedatives, antihistamines, and medication for allergies and colds. Why it is prescribed (Indications) : It is a tetrasaccharide from fungus.It inhibits intestinal alpha glucosidases thereby lowering the hyperglycemic levels.It delays carbohydrate digestion and prolongs digestion time. When it is to be taken : 50 milligrams initially and gradually raised to 50 milligrms thrice daily.Maximum 200 milligrams thrice daily. How it should be taken : It comes in the form of 50 and 25 milligrams tablet. Flatulence, soft stools,diarrhoea,pain and adverse skin reactions are the side effects of this drug. Store at room temperature in a tight container. When it is to be taken : 0.25mg/kg administered 10-60 minutes before the start of atherectomy followed by continous iv injection of 10 micrograms /min. How it should be taken : The drug is availiable in the market in the form of 5 ml vials. keep this medication in air tight container. The primary mode of action of glipizide in experimental animals appears to be the stimulation of insulin secretion from the beta cells of pancreatic islet tissue and is thus dependent on functioning beta cells in the pancreatic islets. In humans glipizide appears to lower the blood glucose acutely by stimulating the release of insulin from the pancreas, an effect dependent upon functioning beta cells in the pancreatic islets. The mechanism by which glipizide lowers blood glucose during long-term administration has not been clearly established. In man, stimulation of insulin secretion by glipizide in response to a meal is undoubtedly of major importance. Fasting insulin levels are not elevated even on long-term glipizide administration, but the postprandial insulin response continues to be enhanced after at least 6 months of treatment. The insulinotropic response to a meal occurs within 30 minutes after an oral dose of glipizide in diabetic patients, but elevated insulin levels do not persist beyond the time of the meal challenge. Extrapancreatic effects may play a part in the mechanism of action of oral sulfonylurea hypoglycemic drugs.Blood sugar control persists in some patients for up to 24 hours after a single dose of glipizide, even though plasma levels have declined to a small fraction of peak levels by that timeSome patients fail to respond initially, or gradually lose their responsiveness to sulfonylurea drugs, including glipizide. Alternatively, glipizide may be effective in some patients who have not responded or have ceased to respond to other sulfonylureas. It has been shown that glipizide therapy was effective in controlling blood sugar without deleterious changes in the plasma lipoprotein profiles of patients treated for NIDDM.In a placebo-controlled, crossover study in normal volunteers, glipizide had no antidiuretic activity, and, in fact, led to a slight increase in free water clearance. Gastrointestinal absorption of glipizide in man is uniform, rapid, and essentially complete. Peak plasma concentrations occur 1 to 3 hours after a single oral dose. The half-life of elimination ranges from 2 to 4 hours in normal subjects, whether given intravenously or orally. The metabolic and excretory patterns are similar with the two routes of administration, indicating that first-pass metabolism is not significant. Glipizide does not accumulate in plasma on repeated oral administration. Total absorption and disposition of an oral dose was unaffected by food in normal volunteers, but absorption was delayed by about 40 minutes. Thus glipizide was more effective when administered about 30 minutes before, rather than with, a test meal in diabetic patients. Protein binding was studied in serum from volunteers who received either oral or intravenous glipizide and found to be 98 to 99% one hour after either route of administration. The apparent volume of distribution of glipizide after intravenous administration was 11 liters, indicative of localization within the extracellular fluid compartment. In mice no glipizide or metabolites were detectable autoradiographically in the brain or spinal cord of males or females, nor in the fetuses of pregnant females. In another study, however, very small amounts of radioactivity were detected in the fetuses of rats given labelled drug.The metabolism of glipizide is extensive and occurs mainly in the liver. The primary metabolites are inactive hydroxylation products and polar conjugates and are excreted mainly in the urine. Less than 10% unchanged glipizide is found in the urine. Glipizide tablets are indicated as an adjunct to diet for the control of hyperglycemia and its associated symptomatology in patients with non-insulin-dependent diabetes mellitus (NIDDM; type II), formerly known as maturity-onset diabetes, after an adequate trial of dietary therapy has proved unsatisfactory. In initiating treatment for non-insulin-dependent diabetes, diet should be emphasized as the primary form of treatment. Caloric restriction and weight loss are essential in the obese diabetic patient. Proper dietary management alone may be effective in controlling the blood glucose and symptoms of hyperglycemia. The importance of regular physical activity should also be stressed, and cardiovascular risk factors should be identified, and corrective measures taken where possible. If this treatment program fails to reduce symptoms and/or blood glucose, the use of an oral sulfonylurea or insulin should be considered. Use of glipizide must be viewed by both the physician and patient as a treatment in addition to diet, and not as a substitute for diet or as a convenient mechanism for avoiding dietary restraint. Furthermore, loss of blood glucose control on diet alone also may be transient, thus requiring only short-term administration of glipizide. During maintenance programs, glipizide should be discontinued if satisfactory lowering of blood glucose is no longer achieved. Judgements should be based on regular clinical and laboratory evaluations.In considering the use of glipizide in asymptomatic patients, it should be recognized that controlling the blood glucose in non-insulin-dependent diabetes has not been definitely established to be effective in preventing the long-term cardiovascular or neural complications of diabetes. 1. Known hypersensitivity to the drug. 2. Diabetic ketoacidosis, with or without coma. This condition should be treated with insulin. Loss of Control of Blood Glucose: When a patient stabilized on any diabetic regimen is exposed to stress such as fever, trauma, infection, or surgery, a loss of control may occur. At such times, it may be necessary to discontinue glipizide and administer insulin.The effectiveness of any oral hypoglycemic drug, including glipizide, in lowering blood glucose to a desired level decreases in many patients over a period of time, which may be due to progression of the severity of the diabetes or to diminished responsiveness to the drug. This phenomenon is known as secondary failure, to distinguish it from primary failure in which the drug is ineffective in an individual patient when first given. Gastrointestinal: Gastrointestinal disturbances are the most common reactions. Gastrointestinal complaints were reported with the following approximate incidence: nausea and diarrhea, one in seventy; constipation and gastralgia, one in one hundred. They appear to be dose-related and may disappear on division or reduction of dosage. Cholestatic jaundice may occur rarely with sulfonylureas: Glipizide should be discontinued if this occurs. Dermatologic: Allergic skin reactions including erythema, morbilliform or maculopapular eruptions, urticaria, pruritus, and eczema have been reported in about one in seventy patients. These may be transient and may disappear despite continued use of glipizide; if skin reactions persist, the drug should be discontinued. Porphyria cutanea tarda and photosensitivity reactions have been reported with sulfonylureas. Hematologic: Leukopenia, agranulocytosis, thrombocytopenia, hemolytic anemia, aplastic anemia, and pancytopenia have been reported with sulfonylureas. Metabolic: Hepatic porphyria and disulfiram-like reactions have been reported with sulfonylureas. In the mouse, glipizide pretreatment did not cause an accumulation of acetaldehyde after ethanol administration. Clinical experience to date has shown that glipizide has an extremely low incidence of disulfiram-like alcohol reactions. Endocrine Reactions: Cases of hyponatremia and the syndrome of inappropriate antidiuretic hormone (SIADH) secretion have been reported with this and other sulfonylureas. Miscellaneous: Dizziness, drowsiness, and headache have each been reported in about one in fifty patients treated with glipizide. They are usually transient and seldom require discontinuance of therapy. There is no fixed dosage regimen for the management of diabetes mellitus with glipizide or any other hypoglycemic agent. In addition to the usual monitoring of urinary glucose, the patient’s blood glucose must also be monitored periodically to determine the minimum effective dose for the patient; to detect primary failure, i.e., inadequate lowering of blood glucose at the maximum recommended dose of medication; and to detect secondary failure, i.e., loss of any adequate blood-glucose-lowering response after an initial period of effectiveness. Glycosylated hemoglobin levels may also be of value in monitoring the patient’s response to therapy.Short-term administration of glipizide may be sufficient during periods of transient loss of control in patients usually controlled well on diet.In general, glipizide should be given approximately 30 minutes before a meal to achieve the greatest reduction in postprandial hyperglycemia.Initial Dose: The recommended starting dose is 5 mg, given before breakfast. Geriatric patients or those with liver disease may be started on 2.5 mg.
AMARYL(glimepiride tablets) is an oral blood-glucose-lowering drug of the sulfonylurea class. Glimepiride is a white to yellowish-white, crystalline, odorless to practically odorless powder formulated into tablets of 1-mg, 2-mg, and 4-mg strengths for oral administration. AMARYL Tablets contain the active ingredient glimepiride and the following inactive ingredients: lactose (hydrous), sodium starch glycolate, povidone, microcrystalline cellulose, and magnesium stearate. In addition, AMARYL 1-mg tablets contain Ferric Oxide Red, AMARYL 2-mg tablets contain Ferric Oxide Yellow and FD&C Blue #2 Aluminum Lake, and AMARYL 4-mg tablets contain FD&C Blue #2 Aluminum Lake. A mild glucose-lowering effect first appeared following single oral doses as low as 0.5–0.6 mg in healthy subjects. The time required to reach the maximum effect (i.e., minimum blood glucose level [Tmin]) was about 2 to 3 hours. In noninsulin-dependent (Type 2) diabetes mellitus (NIDDM) patients, both fasting and 2-hour postprandial glucose levels were significantly lower with glimepiride (1, 2, 4, and 8 mg once daily) than with placebo after 14 days of oral dosing. The glucose-lowering effect in all active treatment groups was maintained over 24 hours. In larger dose-ranging studies, blood glucose and HbA1c were found to respond in a dose-dependent manner over the range of 1 to 4 mg/day of AMARYL. Some patients, particularly those with higher fasting plasma glucose (FPG) levels, may benefit from doses of AMARYL up to 8 mg once daily. No difference in response was found when AMARYL was administered once or twice daily. After oral administration, glimepiride is completely (100%) absorbed from the GI tract. Studies with single oral doses in normal subjects and with multiple oral doses in patients with Type 2 diabetes have shown significant absorption of glimepiride within 1 hour after administration and peak drug levels (Cmax) at 2 to 3 hours. When glimepiride was given with meals, the mean Tmax (time to reach Cmax) was slightly increased (12%) and the mean Cmax and AUC (area under the curve) were slightly decreased (8% and 9%, respectively). After intravenous (IV) dosing in normal subjects, the volume of distribution (Vd) was 8.8 L (113 mL/kg), and the total body clearance (CL) was 47.8 mL/min. Protein binding was greater than 99.5%. Glimepiride is completely metabolized by oxidative biotransformation after either an IV or oral dose. The major metabolites are the cyclohexyl hydroxy methyl derivative (M1) and the carboxyl derivative (M2). Cytochrome P450 2C9 has been shown to be involved in the biotransformation of glimepiride to M1. M1 is further metabolized to M2 by one or several cytosolic enzymes. M1, but not M2, possesses about 1/3 of the pharmacological activity as compared to its parent in an animal model; however, whether the glucose-lowering effect of M1 is clinically meaningful is not clear. When 14C-glimepiride was given orally, approximately 60% of the total radioactivity was recovered in the urine in 7 days and M1 (predominant) and M2 accounted for 80–90% of that recovered in the urine. Approximately 40% of the total radioactivity was recovered in feces and M1 and M2 (predominant) accounted for about 70% of that recovered in feces. No parent drug was recovered from urine or feces. After IV dosing in patients, no significant biliary excretion of glimepiride or its M1 metabolite has been observed. The incidence of hypoglycemia with AMARYL, as documented by blood glucose values <60 mg/dL, ranged from 0.9–1.7% in two large, well controlled, 1-year studies. AMARYL has been evaluated for safety in 2,013 patients in US controlled trials, and in 1,551 patients in foreign controlled trials. More than 1,650 of these patients were treated for at least 1 year. Adverse events, other than hypoglycemia, considered to be possibly or probably related to study drug that occurred in US placebo-controlled trials in more than 1% of patients treated with AMARYL are shown below. Gastrointestinal ReactionsVomiting, gastrointestinal pain, and diarrhea have been reported, but the incidence in placebo-controlled trials was less than 1%. In rare cases, there may be an elevation of liver enzyme levels. In isolated instances, impairment of liver function (e.g. with cholestasis and jaundice), as well as hepatitis, which may also lead to liver failure have been reported with sulfonylureas, including AMARYL. There is no fixed dosage regimen for the management of diabetes mellitus with AMARYL or any other hypoglycemic agent. The patient's fasting blood glucose and HbA1c must be measured periodically to determine the minimum effective dose for the patient; to detect primary failure, i.e., inadequate lowering of blood glucose at the maximum recommended dose of medication; and to detect secondary failure, i.e., loss of adequate blood glucose lowering response after an initial period of effectiveness. Glycosylated hemoglobin levels should be performed to monitor the patients response to therapy.Short-term administration of AMARYL may be sufficient during periods of transient loss of control in patients usually controlled well on diet and exercise. Antidiabetic drugs are medications that work to lower blood glucose concentrations, or the amount of sugar in the blood. They are an important way of treating gestational, type 1 and type 2 diabetes mellitus. There are many types of antidiabetic drugs. Herbal remedies and other forms of alternative medicine are also used for diabetes treatment, especially in areas where modern drugs are not easily available.Antidiabetic drugs exert their useful effects through: (1) increasing insulin levels in the body or (2) increasing the body's sensitivity (or decreasing its resistance) to insulin, or (3) decreasing glucose absorption in the intestines. Metformin is one of the oldest, most widely used, and least-expensive antidiabetic drugs for treatment of type 2 diabetes (T2DM). It is one of several orally-available medicines for this disease, but is very different structurally from the other compounds. Metformin is provided as tablets to take by mouth; the tablets may contain metformin as the only active ingredient or may also contain other medicines. The regular tablet is usually taken with meals two or three times a day. The extended-release tablet is usually taken once daily with the evening meal. Tablets are usually taken at the same time each day and should be swallowed whole. The dose of metformin is adjusted gradually in response to how well it is tolerated and how well the patient's blood sugar levels respond to the drug. In contrast to some other medications, the precise (molecular) mechanism of metformin is not known. However, it is well-established that metformin acts as an insulin sensitizer in that it increases the blood glucose-lowering activity of insulin. The beneficial glycemic effects of metformin are mainly attributed to lowering the amount of glucose produced by the liver (hepatic gluconeogenesis), and increased peripheral tissue insulin sensitivity. Metformin probably works by interrupting mitochondrial oxidation in the liver and by correcting intracellular calcium abnormalities in tissues such as the liver, fat, and skeletal muscle. Metformin is excreted unchanged in the urine. The body does not seem to modify metformin, as no metabolites have been identified in humans, and the drug is not excreted in the bile. After oral administration, about 90% of the absorbed drug is eliminated via the kidneys in the first 24 hours, with a plasma elimination half-life of approximately 6.2 hours. In blood, the elimination half-life is approximately 17.6 hours, suggesting that the drug may enter and leave red blood cells. Metformin alone does not lead to low blood sugar levels; however, it is often taken in combination with other medications that can cause this. Symptoms of low blood sugar (hypoglycemia) include shakiness, dizziness or lightheadedness, sweating, nervousness or irritability, sudden changes in behavior or mood, headache, numbness or tingling around the mouth, weakness, pale skin, hunger, and clumsy or jerky movements.Metformin itself may cause may cause side effects. In most patients, the effects are not troublesome enough to mandate discontinuation. 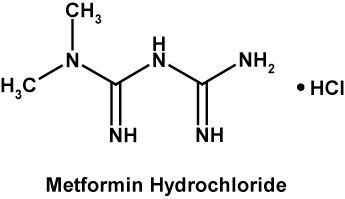 Commonly-reported side effects of metformin include: diarrhea, bloating, stomach pain, gas, constipation, unpleasant metallic taste in mouth, heartburn, headache, sneezing, cough, runny nose, flushing of the skin, nail changes, and muscle pain.Chest pain or rash are serious side effects that require immediate discontinuation of metformin and medical evaluation. Metformin carries a very small risk of causing lactic acidosis; the risk is about 0.03 cases/1000 patient-years, with approximately 0.015 fatal cases/1000 patient-years. Lactic acidosis is characterized by elevated blood lactate levels (>5 mmol/L), decreased blood pH, and electrolyte disturbances. When metformin is implicated as the cause of lactic acidosis, metformin plasma levels >5 µg/mL are generally found. As a dietary supplement, take one (1) capsule before each meal. Do not exceed three (3) capsules per day. High Blood Sugar Levels can be bad news, leading to a number of serious health problems including excess weight gain (obesity), insulin resistance syndrome, diabetes and heart disease. Typically, controlling blood sugar levels has been done through diet, exercise, insulin injections for diabetics, and other prescription medications, some of which can have side effects that include nausea, diarrhea, weight gain, liver damage and respiratory infections. The good news is that Lazarus Labs has just released Glycemil, the pharmaceutical quality, non-prescription product clinically proven to help control blood sugar levels - without dangerous side effects. If you miss a dose of Glycemil, take it as soon as possible. If it is almost time for your next dose, skip the missed dose and go back to your regular dosing schedule. Do not take 2 doses at once. Store Glycemil at room temperature, between 68 and 77 degrees F (20 and 25 degrees C). Store away from heat, moisture, and light. Keep Glycemil out of the reach of children and away from pets. High blood sugar (glucose) levels are associated with a number of serious health problems including obesity, heart disease and diabetes. Diabetes is a disease characterized by the body inability to properly regulate levels of blood sugar by producing or adequately utilizing insulin. It affects over 20,000,000 people in the U.S. alone and is associated with an increased risk of life-threatening complications such as a heart attack, stroke, and/or kidney disease. At present, diabetes is the third leading cause of death in the United States. The brand name drug is an original medication developed and marketed by an originator pharmaceutical company. When the patent of a brand-name medication expires, other companies can introduce generic versions. prescriptions in the United States, and more than 40% of all prescriptions in Canada are filled with generic drugs. DrugInfo will help you to understand the difference between brand and generic drugs and will present you the best online sources of generic medications.